The Lockheed JetStar (company designations L-329 and L-1329; designated C-140 in USAF service) is a business jet produced from the early 1960s to the 1970s. The JetStar was the first dedicated business jet to enter service. It was also one of the largest aircraft in the class for many years, seating ten plus two crew. It is distinguishable from other small jets by its four engines, mounted on the rear of the fuselage in a similar layout to the larger Vickers VC10 airliner that first flew several years later, and the "slipper"-style fuel tanks fixed to the wings. Sixteen JetStars were produced for the United States Air Force. Five C-140A Flight Inspection aircraft to perform airborne testing of airport navigational aids in 1962. They began service during the Vietnam War and remained in service until the early 1990s. 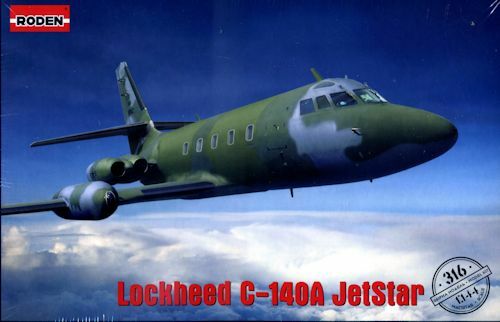 The "Flight Check" C-140A were a combat-coded aircraft that could be distinguished from the VIP transport version by their distinctive camouflage paint scheme. The last C-140A to be retired was placed on static display at Scott AFB, Illinois. An additional 11 airframes were designated C-140B, although the first of these predated the C-140As when it was delivered in 1961. The C-140Bs were used to transport personnel by the Military Airlift Command. Six of the aircraft were operated as VIP transports by the 89th Military Airlift Wing at Andrews Air Force Base. These VIP aircraft were designated as VC-140Bs. The VIP transport fleet occasionally served as Air Force One during the 1970s and 1980s. Several other countries, such as Germany and Canada, have used military JetStars as transports for their heads of state, heads of government, and other VIPs. I have to say that one of my favorite biz-jets has always been the Lockheed Jetstar. Just something about it that looks good. I've always hoped someone would kit it and now Roden has done so. 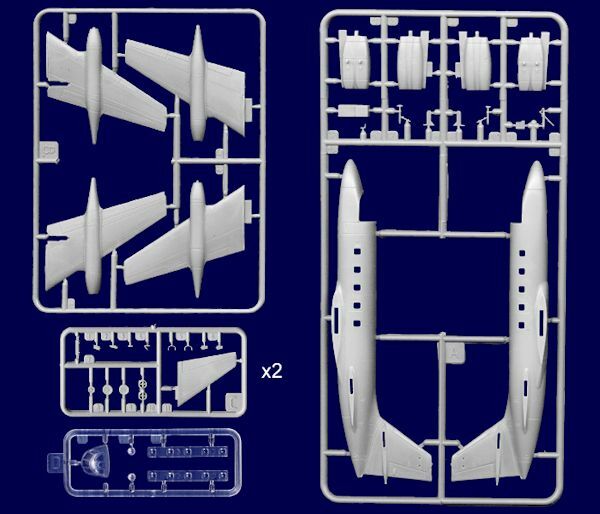 I would sort of liked to have seen this in 1/72 but can fully understand why Roden picked 1/144 as they want it to fit in with their airliner kits. I live almost within shouting distance of Scott AFB and have seen these planes flying in and out of the place and over my house for many years. I missed the very bright schemes, but have seen the planes of what was a flight check squadrons in their SEA and later Euro 1 paint scheme. These were replaced by C-29As which had a rather short career in the USAF before being turned over to the FAA which eventually painted them in civvy schemes. Getting back to this kit. The molding is quite well done and though it has a bunch of nice clear cabin windows and a cockpit transparency, there is nothing to be seen inside. My personal preference would have been for decals for the windows and windscreen on a solid fuselage. However, there are modelers who like to mask windows on their airliners so this is what we have. Som e of the parts for antennas and such are really quite small so one will have to take care when it comes to attaching them. There is lots of room in the nose for weight and like any rear engine jet, this one will need that weight. Landing gear is nicely done and appears quite sturdy. The nose gear well is separate. Engine pods have a separate face and are actually rather thin so I do hope that they fit well. The leading edge of the wing tanks is separate as well as the clear landing light lenses will fit in that area. The decals have markings for one plane and that is 59-5962, one of the flight check planes flying out of Scott AFB. 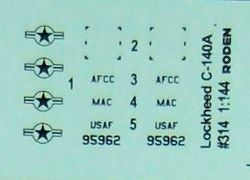 The sheet offers two different upper fin markings. The AFCC would have been used for most of its life in this camo scheme and in the SEA scheme. MAC was used in the last few years. These planes were retired before MAC became AMC. Interestingly enough, the only time I was able to photograph 962 was at Edwards AFB back in 1990 for their open house and have included that as a help for painting if you want to use it. I am quite pleased to see this one being done. I'd like to see it in both the VIP scheme and early AFCS paint scheme (see the photo near the top), though I'd rather see aftermarket for these as Roden decals don't have the best reputation for conforming to complex surfaces. There were also a ton of very cool civil schemes for these planes as well. My thanks to Squadron Products for the preview kit. Get yours today at this link.